If you suffered loss from investing in Wellard shares, you may have a claim. Register with ICP to obtain further detailed information than the summary below. On 20 November 2015 Wellard lodged its prospectus which contained a short 8-month forecast for the balance FY16. This forecast implied gross profit margins would be similar to FY14 and FY15. increased competition and higher supply costs continuing to put pressure on earning’s and in particular Vietnam exports. margin compression created by unexpectedly high record cattle prices in Australia. 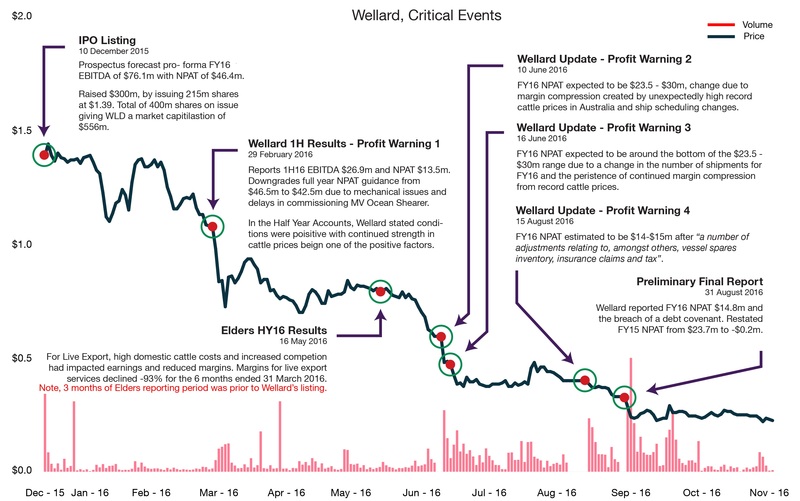 By this time, Wellard’s stock price had declined by -$0.91 or -65%. Shareholders who purchased shares in Wellard between 20 November 2015 and 31 August 2016. Registration is confidential, free and without obligation.